Inspector Knollis of Scotland Yard is hoping for a nice quiet weekend in the country. Instead he is embroiled in a murder case—the death by gunshot of local bigwig Richard Huntingdon. Jean, the dead man’s wife, discovers the body in dense woods near a river. Knollis soon learns that Jean’s previous husband also met an untimely end, not that she is the only suspect. Despite his reputation for good deeds, Huntingdon had enemies in the district, including the progressive Bishop of Northcote. And it turns out the late Mr. Huntingdon was intimately involved with a grade-A femme fatale. . . .
Knollis, along with the redoubtable Sergeant Ellis, has to deal with a plethora of puzzling clues before solving this bucolic case of Murder most Foul. Key to the mystery is a toy yacht found floating on the river near the body—a craft almost identical to the gift recently received—anonymously—by Huntingdon’s young daughter, Dorrie. 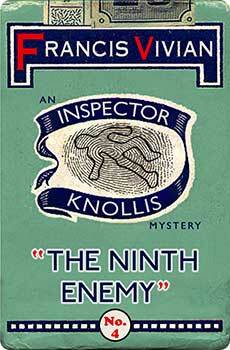 The Ninth Enemy was originally published in 1948. This new edition features an introduction by crime fiction historian Curtis Evans.